Make-Ahead Cajun Chicken and Mushrooms is an entree with chicken and mushrooms covered in a gravy based on a Cajun-flavored roux. NOTE TO PINNERS: There is a picture circulating on Pinterest that connects to this recipe. It contains carrots and is not this recipe. I don’t know how this happened but it seems impossible to correct. 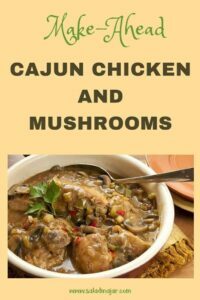 The picture you see on this post is mine and represents the Make-Ahead Cajun Chicken and Mushrooms recipe published on this post. The messiest pages in my 3-ring binder of favorite recipes are those for make-ahead entrees. This working girl would be sunk without them. A couple days ago, I made this for our mid-week family dinner–an informal affair with our married kids, their spouses and our grandson. Even though it was my day off, I knew I would be gone all day. It was easy to put together early in the morning, refrigerate, and serve for dinner. Cajun Chicken and Mushrooms actually gets better after hanging out in the fridge for a few hours. 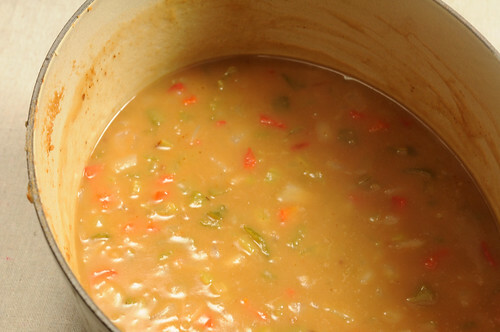 The flavors mix, meld and marry, producing a wonderful gumbo-like flavor. The sauce makes a deliciously rich gravy best enjoyed over a pile of long-grain rice. I used a rice cooker with a timer so the rice was ready when I walked in the door. Brown chicken pieces in large skillet. Melt butter in Dutch oven over medium heat. Stir in flour and continue to stir until a rich milk chocolate brown. 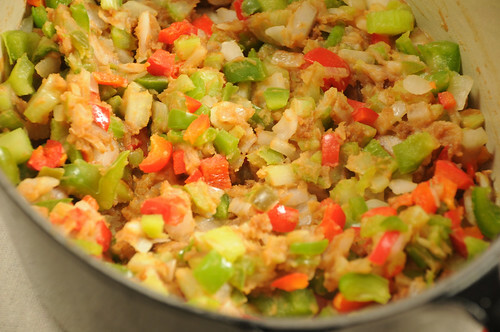 Add onions, celery, peppers and garlic. Cook until softened. 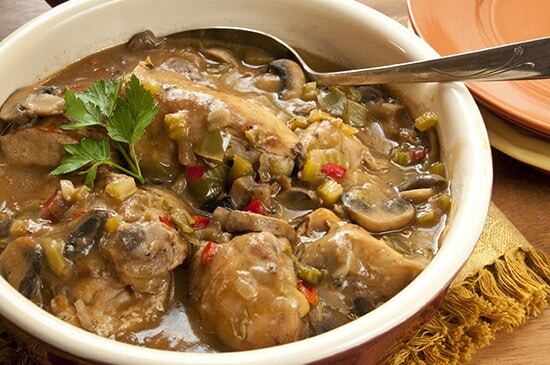 Chicken and Mushrooms in a gravy based on a roux with Cajun seasonings. A good make-ahead dish. Add hot water or broth to vegetables, stirring as you go. Add remaining ingredients, including browned chicken. Cover and simmer for 1 hour. Remove bay leaf before serving over rice. Even better served the next day. I usually cut up a whole chicken but you could use any chicken pieces you already have or prefer such as boneless, skinless breasts or thighs. You don't have to remove the skin but I wouldn't have it otherwise. Because I used a whole chicken, I had the back and wings leftover to make fresh broth--just boil in a pot of water adding a little salt and pepper. I made this recipe today- it does look gorgeous, and I followed it. This took a long time. Unfortunately, I have been making dark roux gumbos for many years, and this took as long as, if not longer (because of the butter based roux, rather than an oil based roux) than a Gumbo Ya-Ya…which it is…..well, partly. I let it sit and then tested the seasonings, and it was missing a lot. I did add thyme, oregano, Tony’s, and some cayenne. I appreciate the recipe, but for the time and effort, would rather make a regular gumbo. The recipe from Mr. B’s in New Orleans is very good, with modifications, as is Paul Prudhomme’s – as is. Note- to the poor soul who burned the roux….done it many times. You must use a heavy pot- cast iron/ Le Creuset, etc. My trick is to add the flour to – preferably oil – with a whisk quickly on really high heat, then turn the heat down to low. It takes about 1 hour to make a good roux, with constant stirring- don’t get the phone, don’t have a smoke, don’t go to the bathroom, and let the kids cry it out. Then, temper the roux and seasonings, cook for 10 minutes, and add the stock- not water ever- very slowly. I also agree that okra has no place in a Cajun gumbo- File in your own bowl please! Thanks for the recipe and will try other stuff from y our blog! recipe sounds great & looks great, almost identical to the way I make my chicken,sausage & shrimp gumbo. In the pic that I pinned it looked like there was also carrots in the pot…? Is that so or another recipe that I couldn’t find on your website? Mushrooms are in the ingredient list, but they are never mentioned again. I suppose they must be added with the other veggies, right? Mushrooms are included in “the remaining ingredients”. Hope it turns out good for you. I don’t have any celery. Can I substitute celery for okra or a vegetbale in order to have have gumbo flavor. I will make that probably tonight. It does look good. And I can I make it spicy? Celery is a pretty important part of many Cajun foods. You might sub celery salt for some of the regular salt. Don’t know of another good substitute. so i cook the butter and flour in a pot on low.. but by the time it looked like chocolate it suddenly smelled like burnt popcorn… is this normal or did i cook it too fast? is it ruined? As you have probably guessed, it is burned, and therefore, ruined. If you cook it too fast and/or don’t stir it continuously (or at least, very often), or use a cheap pan that heats unevenly, it can burn. So sorry. But practice makes perfect. Try again but watch it close. It will not be the color of dark chocolate but more of a milk chocolate/caramelly color. I am making this dish for a second time today. Just forgot to print it out the first time. This was soooo good that all my family loved it, and it is very rare I can please both dad and kids at the same time. There was not a drop left. I am in the process of making this now… when I added 1/2 cup of flour to 1/4 cup of butter the result was a dry crumbly mess, not the smooth sauce you have pictured… are you sure the measurements aren’t backwards? I’m afraid this answer may be too late for you but maybe it will help others. The amounts are correct as listed. The butter and flour will go through stages as it turns brown. First, it will be more like the consistency of mashed potatoes. As it starts to take on some color, it might seem a little dry. (Perhaps this is what you observed as a “dry crumbly mess.”) But as it gets browner and browner it will become more liquid again as seen in the pictures. Just keep stirring. That is the nature of a roux. You could always add more butter, but that will make the end product more “greasy” which is not good in my book. I don’t have a Dutch oven, can I just use a large pot? OK, so technically it is a gumbo…sort of. What you actually made is a chicken fricassee’ (freak-ah-say). Comfort food for any cajun. Minus mushrooms add potatoes you have something really authentic. You can easily substitute shrimp for the chicken, but put it in at the end until it turns pink. A gumbo would be made exactly the same way, minus the mushrooms, more meats added, more roux, and more water. No okra please – that’s so totally creole and not many cajuns would ever do that. If you want to thicken add small amount of file’ to your OWN bowl, not the pot. What an interesting comment! Minus mushrooms (which I adore so I’ll have to think about that), plus potatoes? That sounds so fantastic. And never thought of shrimp. Yes, yes, that sounds good too. I am no expert on this kind of food, as I said on the post, but our family loves okra in our gumbo, so I guess we are totally creole. And I never heard of putting file’ in just the bowl but that makes sense too. We had this dish for dinner last night, and it was great! A nice change of pace from what we are used to. I liked the unique flavor. I was just thinking of Cajun food this weekend. I will definitely have to give this a try. Glad to hear your dad is doing better. You had me at “make ahead!” This looks fabulous! With the weather getting colder I am ready for this recipe. It’s nice to have something new to try and from a source you know you can trust to share only the best. I will be adding a couple of items to my grocery list tomorrow. I think this might be good with left over turkey too. I hope your dad continues to improve. Blessing to you all. Paula, this looks fantastic! Wow, so hearty. I’m laughing because I have done the same thing with my bread maching. This looks delicous. 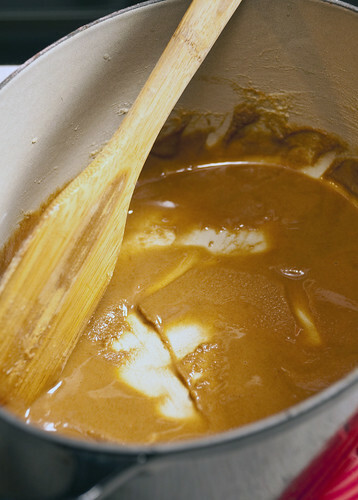 In Louisiana lots of dishes begin with, ‘first you make a roux’ which is exactly what you did with the butter/flour. Gotta be good with that. I love meals that can be made ahead of time too! 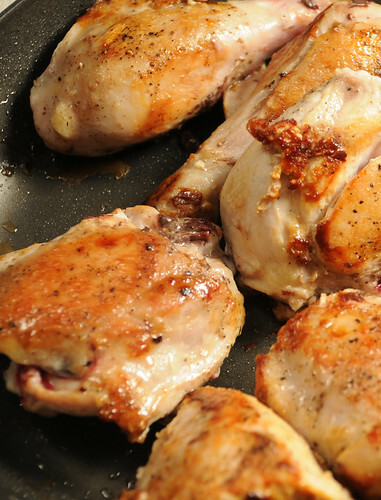 This chicken recipe is sure to be a favourite of my husbands! This one sounds like a keeper! I had to giggle a bit at the bread situation…you were far too organized with your chicken and rice! Something had to break down, right?